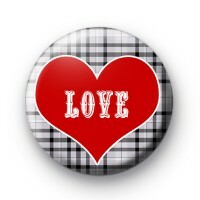 This button badge has a grey plaid pattern background with a bright red love heart and the word LOVE written in bold letters. This is a lovely pin badge for all romantics and people in love. Ideal for giving to someone special this Valentines Day or just pinning to your coat to spread a little love this February. We have so many positive, romantic and love themed badges in the shop so be sure to take a look at our other designs.